When I woke up this past Fourth of July, whisky was the furthest thing from my mind. Scratch that. It was definitely a Top 5 on my list of early morning thoughts. At about 8:30AM, I took my eldest son along with Limpd’s eldest son to the “charming, but regrettably dry town of Haddonfield, NJ“ for their annual Fourth of July Parade (both boys attend the same Tae Kwon Do school and were going to march in the parade together). While waiting for the parade to start, I was goofing around on Twitter and wound up having a brief chat with Mark Gillespie of WhiskyCast and Oliver Klimek of Dramming.com. This Twitter chat eventually led to Mark sharing his Alpha sample with me and an invite for the Booze Dancing crew to do yet another WhiskyCast Virtual Tasting. As I have said many many times, the interwebz is a truly magical place! Appearance: Pale golden color with a slight amber tint. Aroma: Very sweet and fruity on the nose. Getting tart peaches backed with creamy vanilla nougat and powdered sugar. Perhaps even a bit of ripe pears. Last but not least, there’s also a touch of peppermint and eucalyptus. Taste: Light bodied with just a touch of oiliness. Quite a bit of heat concentrated on the front half of my tongue (poblano chile perhaps?). From mid-palate to the finish, vanilla and ripe fruits start to come through with just a hint of sweet tobacco at the very end. The finish is dry and mildly fruity with some of those herbal notes showing up in the aftertaste. I liken my tasting of The Glenlivet Alpha to stumbling upon a movie that you know absolutely nothing about on HBO, only to find yourself completely sucked in and unable to change the channel. Another way of saying this is that since I had zero expectations (i.e. I read very little about this whisky before sitting down to review it), I just let this whisky reveal itself rather than having a set of preconceived notions about how it would smell or taste. So did I like this whisky? Hell yes I did! 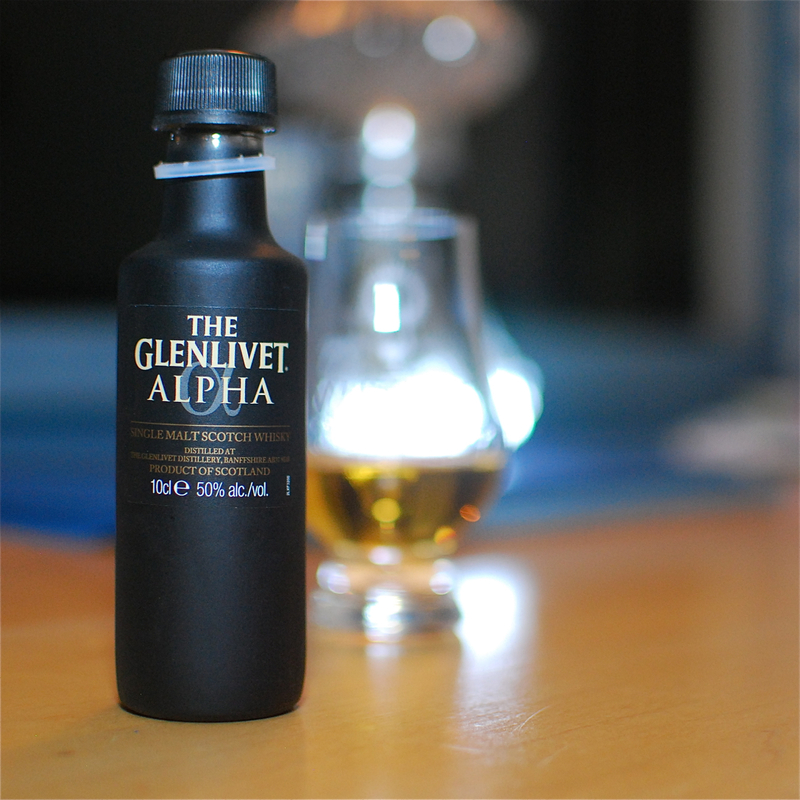 What I enjoyed most about Alpha is how the aromas deceive you into thinking that it will be a soft and gentle dram. While it definitely leans towards the sweet and fruity side of the flavor spectrum, the 50% ABV and moderate spiciness that comes through in the palate remind you that you’re drinking a potent whisky and not some session cocktail. Definitely a dram to sip and savor! Many thanks to Mark Gillespie for sharing his sample! Great review! I didn’t realize this expression existed – I can almost taste it when I read your tasting notes! Well done! Thanks! There was a sizable Twitter tasting of Alpha back in early June. Many of our friends were involved. Sadly, I didn’t get to take part. I’m just glad I got to try it, especially since I think it’s sold out already. You were kind enough to share your sample and I must admit something. While trying to keep it intact for my Pappy, I may have inadvertently drunk some. Mighty fine whisky and a great review! I promise not to tell your Pappy about your greed. Your secret is safe with me. Glad you enjoyed the dram! Pretty tasty stuff I thought.